Looking for a right Galaxy S4 cover or case for your Galaxy S4? This guide is for you. Covers and cases for smartphones can protect our Galaxy S4 from scratches, bumps, smudges and dirt. This is the reason why more than 50% smartphones have covers or cases in US. In UK, the percentage is even higher. Most Galaxy S4 owners has signed the contract with the carrier for 24 (or 12) months. This usually means we are expecting to use Galaxy S4 for 1 to 2 years. Therefore, protecting your S4 from possible damages is one of the things we should do once we get our brand new handset. The cover or case for Galaxy S4 has been available even before the S4 was officially launched. Now, you can get one with just a few bucks. Just like buying anything else, you get what you pay for. Not all cases and covers were created equal: design, quality and style. We must keep vigilant when it is ridiculously cheap. Your grandmother is always correct: if something is too good to be true, it usually is. But nowadays, a lot of products are over-priced, and therefore, a lot of buyers are ripped off. So, when buying a case or cover for your S4, please try to know the product well. Build quality. The material used for case or cover is extremely important. Poor quality material actually may not provide any protection. A non-fit case may even damage your phone. Style. What design do you like? A back case or a flip cover? Black? white? Anyway, this is purely personal choice. Weight. Some covers may be heavier than your S4. Some may be just 10-20 grams. Price. It is not necessary to outstretch your budget. With a few bucks, you can get a decent case for your S4. If you have more budget, of course, you have more choices. But please always remember, an expensive price tag does not mean high quality. Choose what you like. Usually it is hard to recommend accessories because all owners may have quite different taste. In this guide, I will recommend you the 5 recommended covers/cases for Galaxy S4 based on my personal preference. Most of them are available from Amazon. 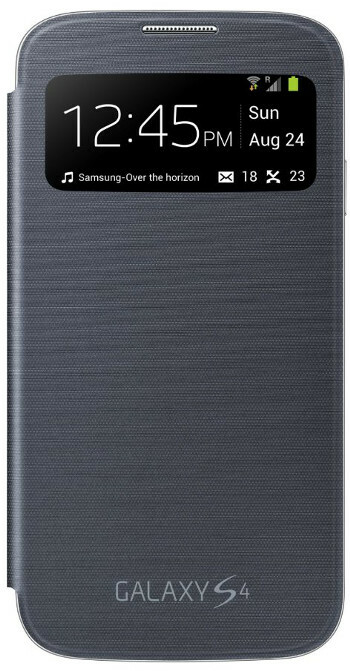 The S-View flip cover case is officially from Samsung. It is quite unique and cool. I am just curious why Samsung didn’t name it as S Cover, or smart cover. When you close this cover, S4’s screen will be turned off, but some useful information, for example, signal and battery status,messages, missed calls, time/date, current music details, will be available through the small transparent window. You can even respond to calls (swipe to accept/reject calls) and alarms without opening the cover. No other covers for Android phone, as I know in the market can do these things. It is cool, isn’t it? Style and light as well. However, this cover only protects the screen. The back is totally unprotected. You must remove the original back cover to use this case. If you need more vigorous protection, this may be NOT for you. Poetic Atmosphere Case is one of the most affordable cases for most smartphones. The case for Samsung Galaxy S4 is not an exception: good quality with a reasonable price ($6.95 at the time of writing this). It is made of polycarbonate with soft rubberized surface. It fits S4 perfectly and all ports and buttons are accessible. Don’t be fooled by the low price, this is a decent back cover case. HHI Flip Wallet Case is crafted from durable synthetic material and has a hard ABS shell lining the inside offering excellent protection while maintaining a slim form factor. The magnetic clasp activates the Galaxy S4’s automatic sleep and wake feature. The case can also fold back to act as a stand. The material and build quality is excellent, although the price is very low ($8.99 at the time of writing) for a wallet case with stand. Ionic GUARDIAN Armor Case for Samsung Galaxy S4 is made of hard plastic with a soft rubberized outer finish. The case provides excellent protection of your S4 from impact and scratches thanks to a rubber inner part and a plastic shell. This case is also wallet friendly. With $9.85 (at the time of writing), you can get one. OtterBox is well known for their rugged protection cases. Otterbox 77-28086 Defender Series is a multi-layer protective case that provides rugged protection. It provides reliable protection from drops, bumps and shock. Port covers block the accumulation of dust and lint in ports and jacks. The screen protector is built into the case to prevent scratches and scrapes to the glass display. If you need ultimate protection of your S4, Otterbox 77-28086 Defender Series case for Galaxy S4 should be your first choice. Of course, the price is not cheap. It will cost you about $50 for it. Which one are you preferring? Let me know in the comment box below. Otter Box defender protects my S4. The holster doubles as a clip and stand for watching movies. Well worth the 50 I paid. Very Good, i like it! i9500 hp no have wifi. i cannot connect to wifi. Did you turn on wifi? Did the phone find your WiFi network? If your S4 cannot find any WiFi network, you should ask the Samsung service center to check your phone. You may ask for a replacement (depending on local regulations) if it is a faulty set. NEW!! Facebook page || Android Guides || Chromecast Guides || Galaxy S6 Guides || Galaxy S7 Guides || Galaxy S8 Guides || Galaxy S9 Guides || Google Home Guides . My Smart Stay and Smart Scroll do not work at all not even the tutorial. Ive had this phone for 2 weeks and its already acting up? Please help, Ive also had problems with my other Galaxy s4, that I got in April and returned it in June because the vibration randomly stopped working. Cant I just once get a perfectly good working phone?